A wetland view from the Lindsay to Bethany rail trail. Continuing my exploration of the many rail trails in the Greater East Dodgeville Area, I rode the Lindsay-Bethany trail last month. The trail runs southeast from Lindsay to Bethany and is the southernmost section of the Victoria Rail Trail, which runs all the way up to Haliburton. Like most trails in the area, the surface is highly variable, sometimes changing between loose gravel, sand, mud, grass, and crushed gravel all in the course of a few hundred metres. At the very southern end past Bethany, a portion of the trail has perfectly spaced and sized depressions; it feels like riding a mini pump track and is way more fun than you’d expect riding on a straight rail trail would be. Most of the trail is hard-packed double track that’s easy enough to ride on, but you do have to be ready for the occasional potholes and surface changes that come with a trail that isn’t quite up to Trans Canada Trail standards like the Omemee and Hastings trails are. I seem to say this of a lot of trails, but I wouldn’t recommend it for hybrids or road bikes. It’s quite acceptable on a decent mountain bike, with or without front suspension. Of all the trails I’ve been on recently, it’s also the most heavily used by ATVs: I encountered close to a dozen of them in the first few kilometres riding out of Lindsay on a sunny Sunday afternoon, though there were none on the last half of the trail to Bethany. One thing does set the Bethany trail apart from all of the other trails I’ve been on recently: it feels very isolated. 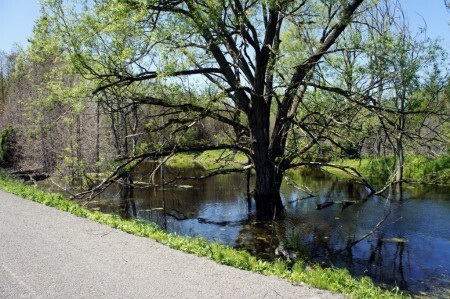 While most other trails pass behind backyards and farm fields, the Bethany trail spends a lot of time skirting large wetlands and valley forests while the Pigeon River and Fleetwood Creek meander back and forth with no farm fields or houses anywhere in sight. Even road crossings become rare on the southern half of the trail, making the whole experience feel more wild and natural than other trails, even knowing that the farms and quarries are still there, just a little out of sight. Another rare sight is clearly visible at every intersection where the trail crosses a road: signs! 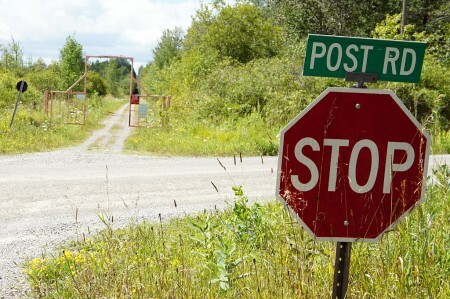 No, not the stop signs, but honest-to-goodness street signs. It’s the first trail I’ve been on where every intersection is marked so that you don’t have to guess which road you’re crossing. It’s a wonder that more trails don’t have this simple nod to the fact that people may want to know where they are. Read on for the ride gallery. The Lang-Hastings Rail Trail before and after its makeover. What a difference a year makes! 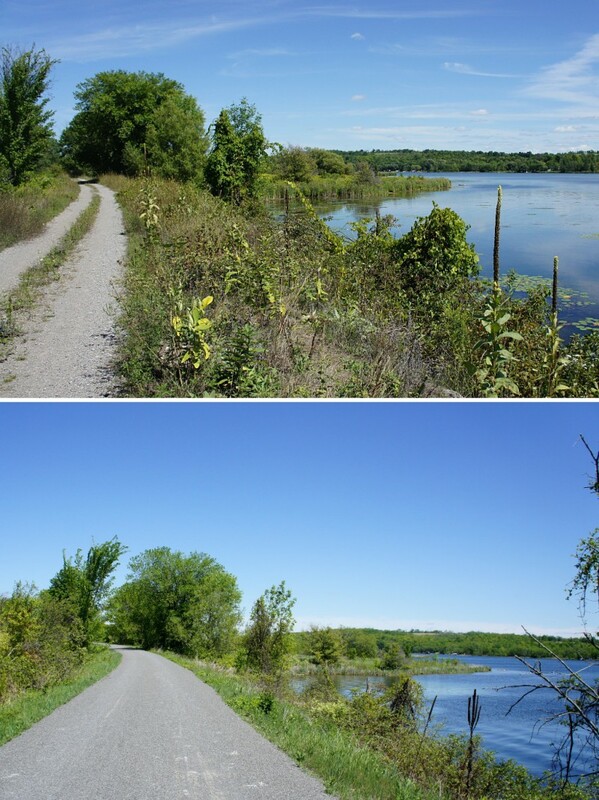 I first cycled the Peterborough to Hastings rail trail last August, saying at the time that the trail was “challenging” because of the relative lack of summer maintenance. 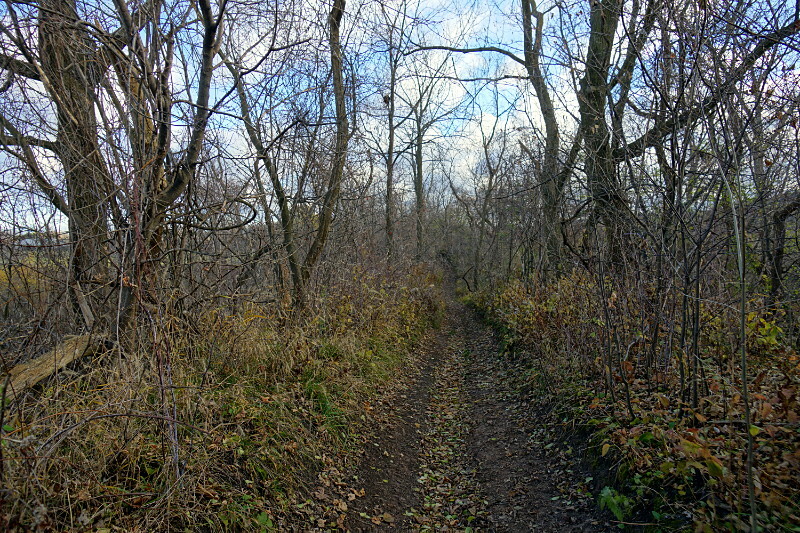 Back then, the trail was rough, somewhat overgrown, and best suited to a mountain bike with at least front suspension. At that time, a plan was afoot to improve the trail and elevate it from a “proposed” route for the Trans Canada Trail to being an official part of the cross-country walking and cycling path. Well, the trail got its promised upgrades last autumn and spring, was officially named the Lang-Hastings Trans Canada Trail, and is now an absolute pleasure to ride on. A beaver pond along the Lang-Hastings trail. The trail starts at the southeastern edge of Peterborough and meanders east toward Hastings on the Trent River. Like most rail trails, it’s quite flat, with long gentle grades rather than hill climbs. It passes behind farm fields, beside quiet country roads, next to wetlands, and between hills. The new crushed limestone surface brings the Lang-Hastings trail up to the same quality as the Omemee trail to the west and is a vast improvement over the rutted and loose gravel double track I rode last summer. With a better trail comes more traffic: instead of cycling for 90 minutes without seeing another soul as I did last year, I encountered at least two dozen people riding the trail on a sunny Sunday afternoon in May. There were even a couple of spandex-clad roadies enjoying the smooth ride. The trail head is a little awkward to access from the Peterborough end, where it doesn’t quite match up yet with the rest of the Trans Canada Trail to the northwest. Don’t make the mistake of trying to join the trail from Technology Drive in Peterborough; the trail there is wholly unimproved and still has rails and ties for about the first kilometre. 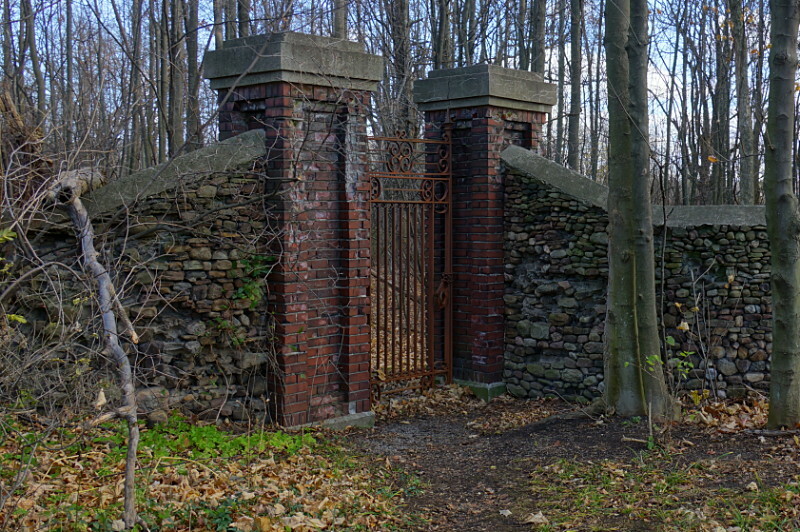 Your best bet is to join the trail at Keene Road, a short distance outside Peterborough. There’s some roadside parking available there, or you can make the relatively quick ride from downtown with only a short section along a busy Highway 7 / Lansdowne Avenue. Although I wish the connections at either end were more direct, I’m happy to have the Lang-Hastings trail brought up to standard. With more users will come greater pressure for connectivity and improvements for other trails, and that can only be good. 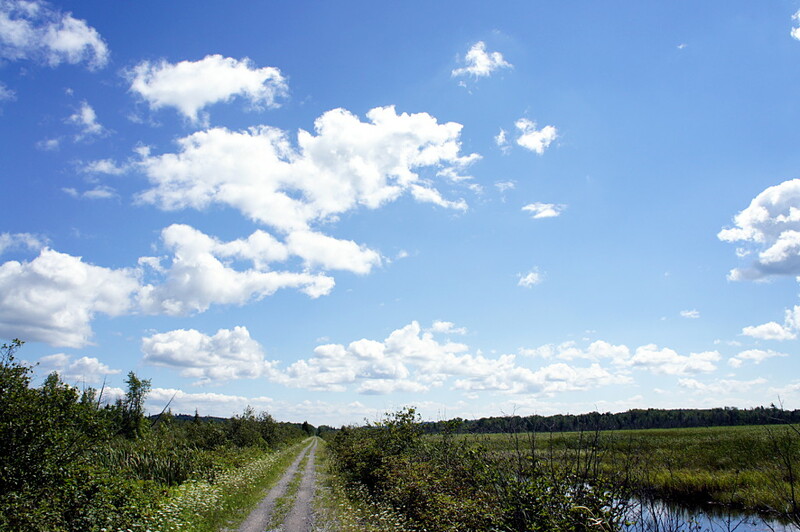 Peterborough is at the centre of a network of trails that stretches from Uxbridge and Lindsay in the east, to Haliburton and Bancroft in the north, Prince Edward County in the south, and Renfrew in the east. As the gaps in existing trails are filled in and more of them are improved to be suitable for casual cyclists, you could be looking at the backbone of Ontario’s own Route Verte-alike cycling network. Continue reading below the fold for a short gallery from along the trail, and compare it to last year’s ride along the same route. The first leg of the Upper Canada Heritage Trail looks like many other rail trails. The majority of the trail runs beside Concession 1 and passes numerous orchards and vineyards. Risa attended a meeting in Niagara-on-the-Lake last weekend and I tagged along for the drive down the QEW so that I could take a walk down an old railway, now the Upper Canada Heritage Trail. It travels about 11 km from the Bruce Trail west of Queenston down to the Waterfront Trail on Lake Ontario. Combined with the first few kilometres of the Bruce Trail from Queenston Heights and the General Brock Trail along the Niagara River, it constitutes a day-long hiking loop over mostly easy terrain. The UCHT would definitely be the quieter side of the loop, especially at this time of year. Risa tossed me out of the car at the trailhead at York Road and Consession 2 and told me I had three and a half hours to get to Fort George or I’d be walking all the way home. The terrain was about what you’d expect in a rail trail: mostly flat, mostly straight, and mostly running behind farms. A portion of the trail just north of York Road was completely washed out: about 20 metres of the raised railbed had collapsed into a jumbled mess of trees, dirt, and rocks below. The resulting hole is navigable on foot with sturdy boots and a bit of care, but don’t expect to pass with your bike or horse. Several large potholes and a subsiding trail leading up to the washout hint that much more of the old railbed here is probably going to collapse in the near future. 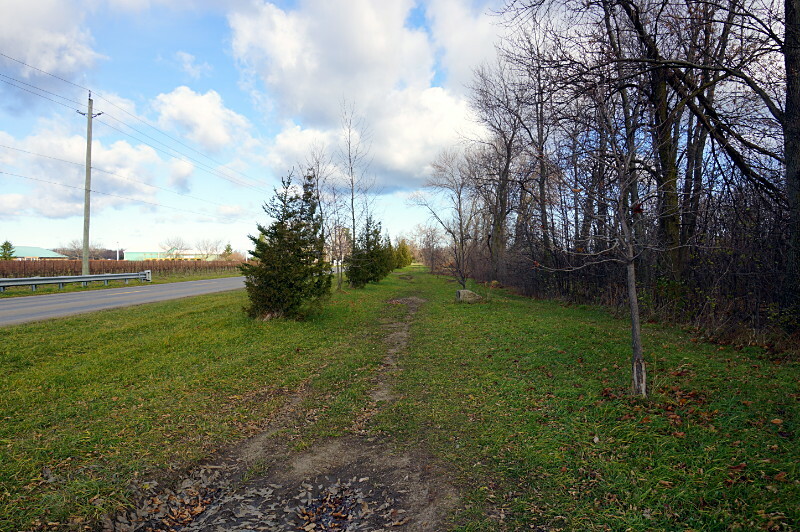 The long middle stretch of the trail runs dead straight and flat beside Concession 1 and is a pleasant walk alongside a quiet country road lined by numerous vineyards and orchards. Autumn is usually my favourite time to go hiking but this portion of the trail would probably be much nicer in the late summer with the sights and smells of all the fruit coming into season. The third section of the trail curves up through suburban Niagara-on-the-Lake heading toward downtown. It feels like more of an urban rail trail, with numerous well-kept backyards opening right up onto the trail. Just imagine having a section of the Bruce Trail literally outside your back door. This section is also home to the most interesting sight on the trail, a long stone wall. It looks long abandoned and neglected at first, but it does still separate private homes from the trail. Numerous sections have fallen down and been replaced by ugly wooden or chain-link fences, while another portion would have fallen over if it weren’t propped up by three large metal beams. 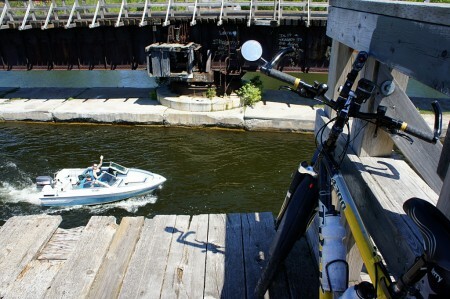 The trail ends at the Waterfront Trail, a short walk away from downtown Niagara-on-the-Lake and Fort George. All in all, it’s a nice walk, if not a challenging hike. The Waterfront Regeneration Trust, which manages the Waterfront Trail along the length of Lake Ontario, is expanding it to include the Lake Erie shore starting next year. This has probably been in the works for a while, but the news seems to be flying below the radar so far. I don’t expect the trail to emerge next spring as a finished entity along the entire Lake Erie shore, but adding 620 km of signed on- and off-road trail is a huge step forward. A lot of cyclists in Ontario (myself included) salivate at the thought of our own Route Verte connecting the corners of the province. A lot of the infrastructure is already in place, with numerous long-distance trails radiating across many regions of the province. Some of them are already managed as pieces of larger trail networks like the Waterfront Trail, the Central Ontario Loop Trail, and the Trans Canada Trail. Still, completing a provincial network wouldn’t be trivial: some trails would need to be need to be improved to be suitable for casual cyclists and filling in the missing links would need to be prioritized. Closest to home, Toronto suffers from relatively poor connections to out-of-town trails. The Waterfront Trail is nice, but won’t get you to the numerous bike routes that start north of the city. That’s one reason I like the hydro corridors so much: they’re quiet routes through the most car-centric parts of the city and have tremendous potential for linking to trails beyond Toronto’s boundaries. We need more of them. Follow an obvious and sane route. I’ve ridden the Waterfront Trail through Oakville a number of times and have never been able to follow the official route. It seems to constantly duck onto short side streets for one or two blocks before coming right back up to Lakeshore Road. The route may travel one block through a park that is otherwise two blocks away from the through-route. The little jogs just add distance and confusion to the overall route and make it incredibly easy to get lost. The situation is the same in parts of St. Catharines, Toronto, and probably elsewhere. I’d much rather just have a relatively straight route than one that takes me two blocks out of my way so that I can ride for one block on a quiet street that’s still nowhere near the water. A cyclist shouldn’t need to consult a map to follow a signed route, any more than a driver should need a map to drive straight on the 401. Have more visible and more consistent signage. One of the reasons it’s so easy to lose the trail as it zigzags from street to street is that many directional signs are so small that they border on invisible. The small size is compounded by the fact that many directional arrows are pale orange on a tan background and don’t exactly call your attention to them. You’ll never see one unless you’re actively looking for it. I understand that there was some NIMBY resistance in the early days of the Waterfront Trail, but surely it’s well-established now and can push communities for better signage. Signs have improved in a lot of areas, but there’s still much work to do. If you’re anything like me, sometimes you see something at the side of the road that you just have to stop and check out. 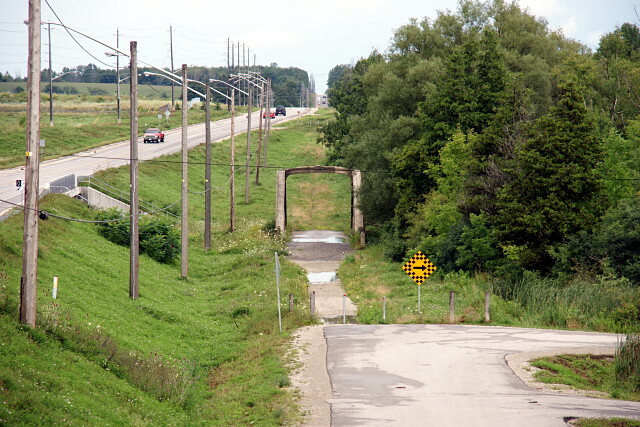 This is a prime example from last year: a concrete bowstring bridge beside the current alignment of Stone Road outside Guelph. According to the crossbar, it was built in 1916. The modern bridge that carries Stone Road today was built in 2005, but it’s difficult to believe that the old bridge was still carrying cars just four years ago; it looks like it’s in pretty rough shape. 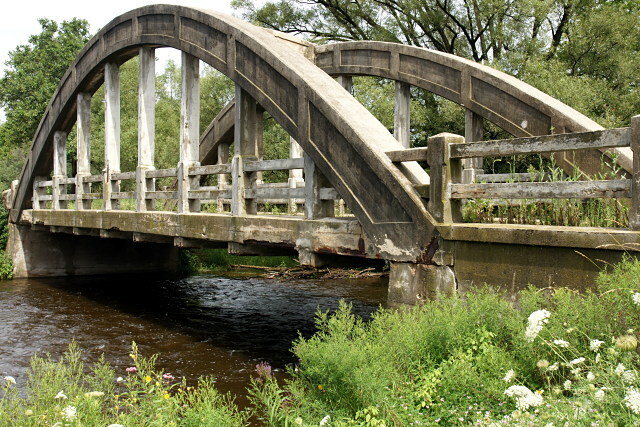 The bridge was designated as a heritage structure in 2003 (PDF) and became part of a walking trail along the Eramosa River after Stone Road moved a few metres north to the new bridge. 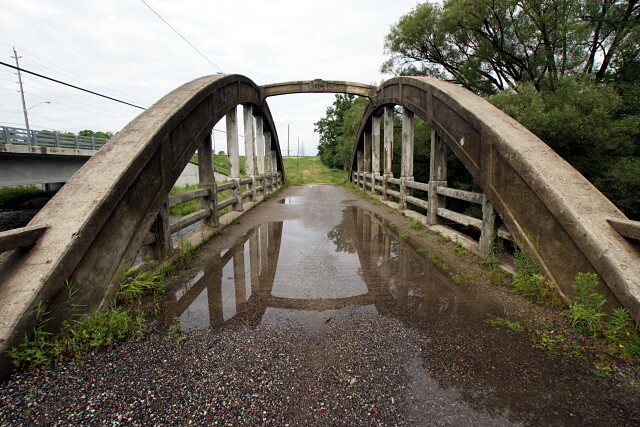 I don’t know when we stopped building this kind of bridge, but I think the two that still exist in the Don Valley date from around the same era as this one. 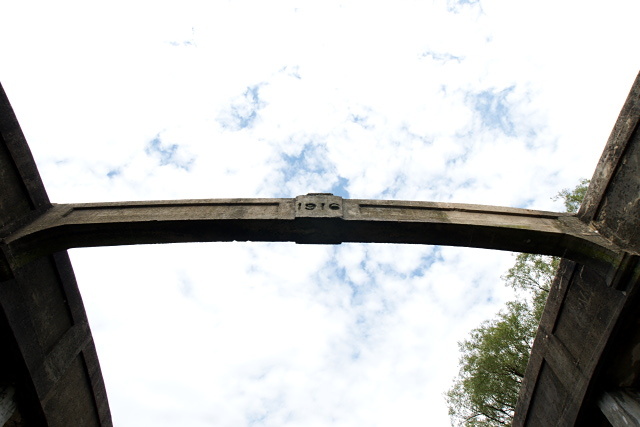 The sight of a concrete bowstring bridge always makes me smile; they seem to strike the perfect balance between elegance and industry.